Salmond didn't mention the liabilities, which is unfortunate since if you take a share of an institution you must take both the assets and the liabilities. The liabilities of the Bank of England are the monetary base of the United Kingdom – sterling notes & coins and sterling bank reserves. On a population proportion of 8.38%, Scotland owns/owes £186bn of HM Treasury's balance sheet, and so the question is how best to deal with that. The TL;DR version is that £186bn of the shortest dated Gilts from the Asset Purchase Facility are uplifted to HM Treasury and written out there - reducing both the Gilts outstanding and the Taxpayer Equity figure by £186bn and creating an asset adjustment at the Bank of England. That then settles the Scottish share of the UK National Debt, and the Scottish claim over the Bank of England in one neat accounting journal. Scotland's government owes nothing in GBP, and the UK has no outside entity with any claim over its central bank. What Wilson is suggesting is that £186bn of the gilts at the APF, representing Scotland's share of the UK national debt, should be written off. If this were done as a balance sheet writeoff, that would mean an immediate reduction in the sterling monetary base of £186bn, wiping out nearly half of the QE expansion at a stroke. As the monetary base is made up mainly of bank reserves, it would be bank balance sheets that took the hit. Done in this way, the price of writing off Scotland's debt would be either instant insolvency for the UK's banks or an undignified scrabble for whatever gilts remained in circulation. Clearly this is a non-starter (though it would reduce gilt yields to something nicely negative). But that isn't what Wilson is suggesting. What he has done is rather cleverer. In his model, the gilts are written off against something called “Taxpayers' Equity” on HM Treasury's books, which is actually expected future tax revenues (and therefore sits on the asset side of the balance sheet). The monetary base remains untouched. In effect he has written off part of the asset side of the Bank of England's balance sheet, rendering it technically insolvent, then recapitalised it with an asset transfer from HM Treasury's balance sheet. Writing off QE gilts in this way would mean that nearly half of the QE expansion of monetary base could not be unwound through normal open market operations, since it would no longer have tradeable assets backing it. In effect, the UK would have monetised Scotland's share of its debt. The trouble is, this makes Wilson's proposal legally impossible. The UK is a signatory to the Lisbon Treaty which forbids monetisation of government debt. Scotland would not have monetised anything, since it would simply have written off gilts on both sides of its balance sheet with no monetary expansion involved. But the UK would have broken Article 123. Monetising Scotland's share of the UK debt also raises serious questions regarding the conduct of UK monetary and fiscal policy post-independence. In the integrated central bank/government model that Wilson uses, tax revenues sterilise monetary expansion (government spending): government spends money into the economy, and money is recycled back to government in the form of taxes. 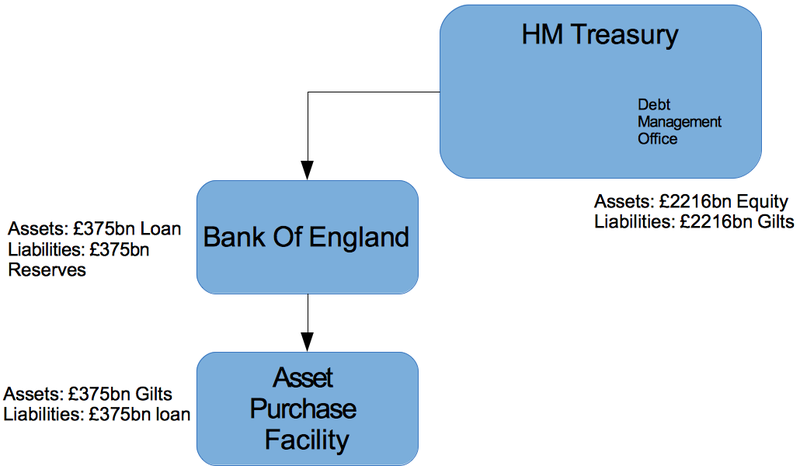 The sale or loan of gilts to the private sector by the Bank of England acts like a windfall tax, since it drains money from the private sector: this is how normal monetary operations work. In the absence of gilts to sell or lend back into the market (open market operations), the only way of draining reserves would be to raise taxes: this might be dressed up as interest rate rises (to preserve the fiction of central bank independence), but it would amount to the same thing. Wilson concludes that because “Taxpayers' equity” is the net savings of the private sector, there would be no cost to the UK taxpayer from monetising Scotland's debt. If the monetary base expansion were both permanent and non-inflationary, this would be true. But books have to balance. Considering the central bank and government as an integrated unit, if the monetary base (liability) shrinks, so must taxpayers' equity (asset). QE was only ever supposed to be a temporary expansion of the monetary base: at some point, the plan is to unwind it. If half the gilts purchased under QE were written off in settlement of Scotland's share of UK debt, unwinding QE would inevitably mean tax increases (or equivalent interest rate rises) – which would fall wholly on the reduced UK population, since post-independence Scotland's population is not going to contribute taxes to HM Government. Salmond would no doubt argue that as Scotland intends to continue to use sterling, there would be no need to reduce the monetary base to reflect the smaller size of the UK economy. But as the only fiscal backing for the UK's monetary base comes from the UK government, the Bank of England would be irresponsible if it considered Scotland's needs when determining an appropriate size for the monetary base post-independence. The size of the monetary base should be appropriate to the size of the UK economy: it would not be unreasonable for the Bank of England to conclude that it must shrink. To be sure, there are other gilts that could be sold to drain the reserves: this model wipes out less than half of the Bank of England's holding. But it would make it impossible to return to pre-2008 monetary policy in the long run without somehow obtaining higher tax revenues. Of course none of this would be remotely appropriate in Salmond's preferred option, a currency union. If the UK were to enter into a currency union with an independent Scotland, HM Treasury would issue Scotland with shares in the Bank of England. If Scotland repudiated them in favour of its share of Bank of England assets, it would de facto have rejected the currency union. It cannot have both a currency union AND a share of Bank of England assets. Currency union means sharing the institution, not stripping its assets. And I'm not convinced that using the gilts at the Bank of England to write down Scotland's share of debt is sensible anyway. After independence Scotland would be cut off from Bank of England currency issuance. If it continued to use sterling without a currency union or used its own currency backed by sterling it would need substantial sterling reserves. Scotland would do better to keep the gilts as sterling reserves - they wouldn't be enough, but they would be better than nothing. Alternatively, Scotland could claim the value of its share of the Bank of England's assets in the form of physical cash, in which case we would presumably give them Giants and Titans to the value of their claim on Bank of England assets. The accounting for this would be different from Wilson's model, of course: since the Bank of England is the issuer, these would remain on the Bank of England's balance sheet as a liability, and the gilt holdings would be untouched. But in fact Scotland cannot eliminate its share of UK debt by writing it down against the value of its share of Bank of England assets anyway. The market value of Scotland's share of the assets of the Bank of England is less than the market value of its share of UK debt. Wilson assumes that Scotland's debt would be entirely monetised from Bank of England holdings of gilts. But this is a larger share of the Bank of England's assets than Scotland should have, whether judged on population or GDP. If a “fair share” of Bank of England gilt holdings were written down against Scotland's share of national debt, there would still be debt left over. I fail to see why the UK should monetise the whole of Scotland's debt simply because the Bank of England is wholly owned by HM Treasury. And all of this will be immaterial if the Scots vote “No”, anyway. For a few years, at least. Perhaps Salmond is mimicking Portuguese splitting of Banco Espirito Santo? "QE was only ever supposed to be a temporary expansion of the monetary base: at some point, the plan is to unwind it." I've never understood, notwithstanding the Lisbon Treaty, if you take a consolidated view of government, why this would be the case? If one branch of government owes money to another, why not just write it off. And what is the real meaning of the debt figures if this is true? If you can point me to something that explains this, I'd appreciate it. "... why not just write it off" ... or let it expire. To put it very crudely. The SNP and allies are hard left. Hard left regimes are highly prone to default, one way or another. It is built into their vision of challenging capitalism, economic enemies and international potential opposition. Could I sell you a few of grannies Tsarist bonds? A lot of people don't know that. It is not the facts, but what people believe, that matters on occasions like this. . Frankly, I will stick with Neil Wilson's accounting. "Taxpayers equity" is the phrase used by the BoE Whole of Government Accounts (WGA). The latter presents the accounts as if the UK were a "plc". https://www.gov.uk/government/uploads/system/uploads/attachment_data/file/324910/PU1668_WGA_summary_report_revised_layout_4_page_spread_final.pdf . You will see as a plc, the UK is a busted flush until you remember it can spend its own money Pounds into existence any time and as much as it wants. The Treasury and the BoE are one and the same (WGA consolidates the two from the start). If the BoE creates (spends) new money to buy Gilts issued previously by the Treasury, it is the equivalent of the DMO never having issued those Gilts in the first place; they can be shredded. The "reserves" created when the BoE swapping the Gilts for base money, can remain as reserves at the BoE. The "reserves" part of base money is the original spending of new money into the economy by the government. Nobody can buy Gilts until the government spends money into the economy to buy them. Likewise, the government always has to spend before it can or has a need to tax, else there wouldn't be any money, the government would accept (its own) to pay either. The government ISSUES the currency, why would it want to borrow it back AND pay interest on it, when it has a bottomless pit of the stuff. The government chooses to issue debt to match its spending. There is no operational need to issue debt that pays interest, unless you want to give welfare payments to rich people. Some of it is useful for controlling LIBOR but there are better ways of adjusting the amount of money in "reserve accounts at the BoE.